I know that if you read my blog a lot, you might somehow get the impression that I'm constantly in the kitchen, whipping up tasty treats and elaborate dinner parties on the weekend, and virtuously making and bringing my lunches to work during the week. And you know what, that can be the case... sometimes. But we all get into little ruts sometimes, and often when I do one of these posts on healthy food, it's after a week of lazily failing to plan my meals, resorting to sad little tins of tuna and rice for lunch and (gasp!) oven chips for dinner. I whipped up this salad last week, when I felt like I needed a kickstart to get back into the swing of bringing lunch to work. I love a good grain salad, and made it up using different bit and pieces I had in the pantry and fridge. 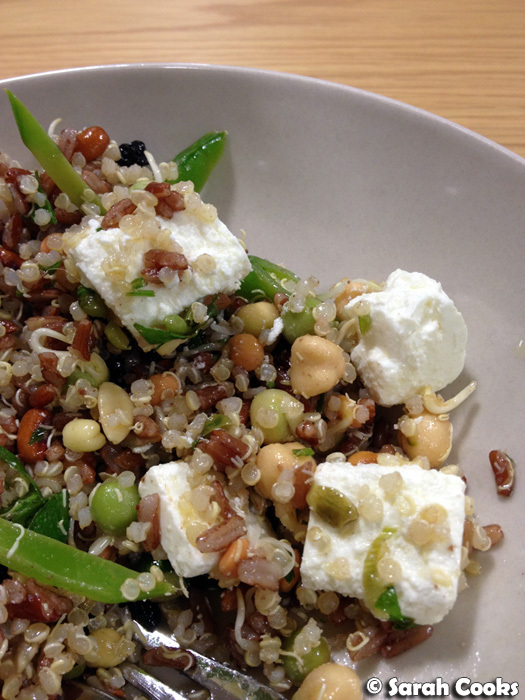 I started off with a base of red rice and quinoa (like Ottolenghi's red rice and quinoa salad), adding crunch in the form of toasted mixed seeds and crunchy sprouts (like Jill Dupleix's Greens and Grains), sweetness in the form of currants, and raw snowpeas and chopped parsley for greenery. For extra deliciousness, I topped it with marinated feta to serve. When making it up, I knew it would be healthy and nourishing, but I didn't realise just how fantastic it would taste. There's something about the mix of textures that is just so compulsive! I ate quite a bit of it when making it (in the name of "taste-testing", you understand), and shared it with one of my coworkers, who totally loved it and wolfed down a massive bowl of it in no time at all - I guess you can make friends with salad! I named this salad Power Salad, in honour of the fact that it's full of protein, thanks to the quinoa, mixed seeds and crunchy sprouts, but also because making it powerfully got me out of a lazy little food rut. I hope it can do the same for you. Add the red rice and 2 1/4 cups water to a small saucepan with a tight-fitting lid. Bring to the boil, then turn the heat down to the lowest possible, clamp on the lid and allow to cook for 20-30 minutes, until the water is absorbed and the rice is cooked. Tip onto a wide flat plate to cool. Cook and cool the quinoa in the same way, using only 2 cups water, and letting it cook for 10-15 minutes. While the grains are cooking, you can get on with the rest of the salad. Toast the mixed seeds in a dry frying pan until lightly brown and aromatic. Set aside. Get out a large mixing bowl, and add the spring onions, lemon juice, olive oil, snowpeas, sprouts, currants and toasted seeds. Tip in the cooked red rice, quinoa and parsley, and stir with a fork to mix. Season with salt and pepper to taste. To serve, top with marinated feta and dig in! Wow, that looks super healthy! Certainly beats my standard spinach, cherry tomato and cucumber!